This section covers a range of creative ideas to present concepts. In this comprehensive section we start with a range of tips and techniques to start off using visuals. This includes common mistakes made when presenting with images. Graphics in presentations ensure that you go beyond bullets. You can convey your information easily with the range of visual presentation ideas and graphics with the help of the articles below. The section provides a number of innovative PowerPoint Slide ideas for everything from agenda slides, process slides, consulting diagrams and more. Creative graphics ideas are covered extensively with examples. You will also find detailed detailed before and after scenarios in making over existing slides. If you wondered why you need to use more visual slides and diagrams, the concluding section covers the science behind this. Please click on a section to browse detailed articles. This section covers tips and techniques for more creative presentations. 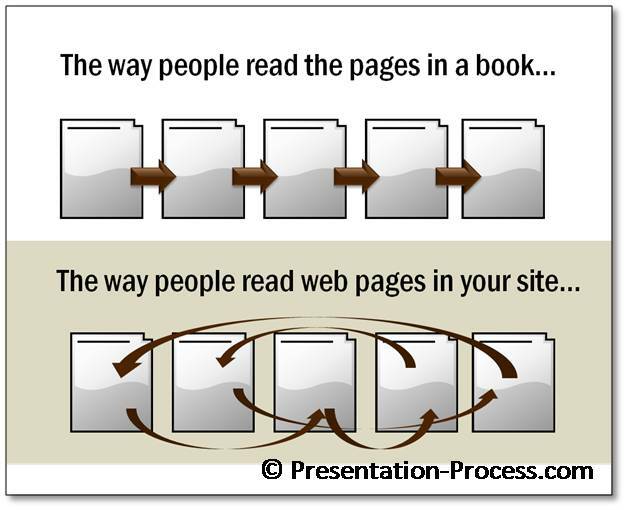 It covers using diagrams, visuals and how to avoid common mistakes that presenters make. This section provides lots of Ideas for every section of your presentation. From creating agenda slides to business concept slides to closing with Thank You slides! This section provides detailed examples of how you can makeover bullet point slides to creative and visual PowerPoint slides complete with animation and explanations. A PowerPoint diagram represents information or process visually. In this section, we will deal with the science behind why it is important to use a graphical representation rather than words. Presenters who wish to make their slides creative are constantly in search of ideas. This section helps in making over regular slides into creative and interesting presentations. If you liked this section, please do leave a comment for us below and share the site with your friends.